In 4-quart saucepan, heat 1 inch water to boiling; add potato pieces. Cover and heat to boiling; reduce heat to low. Cook 20 to 24 minutes or until very tender; drain, and return to saucepan. Shake saucepan gently over low heat 1 to 2 minutes to dry potatoes. Remove from heat. Add whipping cream, butter and 3/4 teaspoon salt to potatoes in saucepan; mash with potato masher or electric mixer until potatoes are light and fluffy. Stir in cheese. Set aside. Heat oven to 425°F. Spray 13x9-inch (3-quart) glass baking dish with cooking spray. Toss beef with flour, 1 1/2 teaspoons salt and the pepper. In 12-inch skillet, heat 2 tablespoons of the oil over medium-high heat. Cook beef in oil 5 to 7 minutes or until browned on first side; stir. Cook 5 to 7 minutes longer, stirring frequently, until browned on all sides. Spread in baking dish in single layer. Add remaining 1 tablespoon oil to skillet. Add onions, carrot and celery; cook 5 to 8 minutes, stirring frequently, until beginning to brown. Stir in tomatoes, soy sauce and garlic; cook 3 to 5 minutes, stirring frequently, until liquid evaporates. Spread evenly over beef in baking dish. Spoon potato mixture over vegetable mixture; spread evenly. 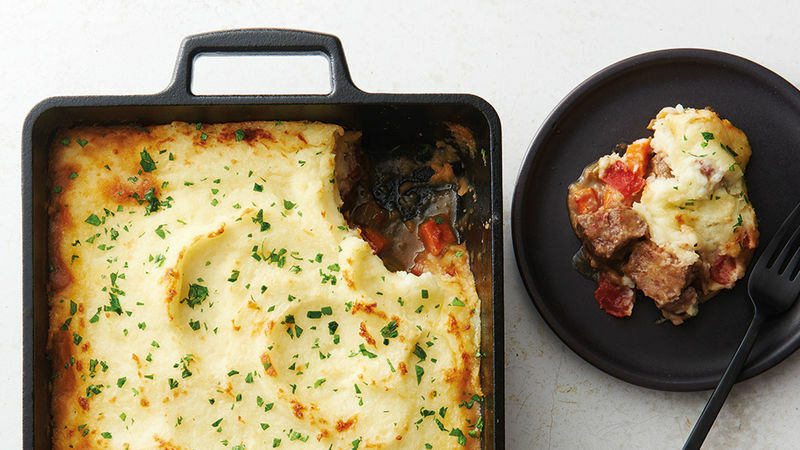 Bake uncovered 30 to 35 minutes or until beef is tender and top of potatoes are crispy. Top with parsley. Can’t find boneless short ribs? Ask your butcher to bone the short ribs for you.